So far Pups of Liberty: The Boston Tea-Bone Party has been a hit! We just wanted to remind all of those who have ordered the DVD that we also have a special section on our website that has lots of content for teachers and students. 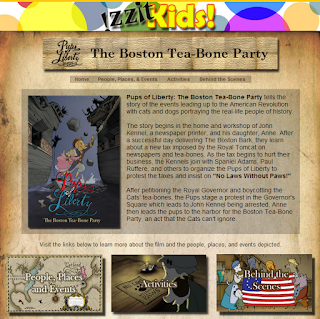 It's in our izzitKIDS section and includes an interactive map and timeline, information about the characters, and behind the scenes information and artwork. Also, don't forget to tell all your colleagues that they can order their free copy too at www.izzit.org. And for your non-teacher friends, they can purchase the DVD at a special introductory price of $15.00 here.